Biogen's stock tanked more than 29 percent on Thursday after the company ended the trial of Alzheimer's disease drug aducanumab. The company said the decision to stop the phase 3 trial came from a independent group's analysis showing that the trials were unlikely to "meet their primary endpoint." The recommendation to stop the studies was not based on safety concerns, Biogen said. Goldman Sachs analysts had projected at one time that sales of aducanumab could reach $12 billion. Shares of Biogen plummeted Thursday after the company halted the trial of Alzheimer's disease drug aducanumab, which it was developing in partnership with Japanese pharmaceutical company Eisai. 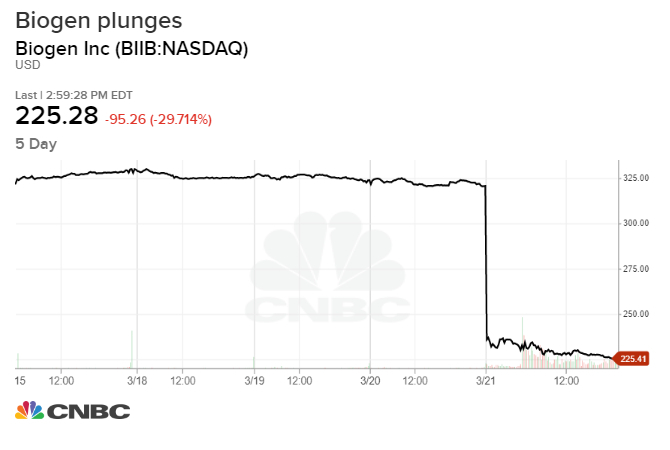 Biogen's stock tanked more than 29 percent Thursday, posting its worst day since Feb. 2005 because the drug was expected to be a blockbuster. Biogen is one of the largest biotechs in the world with a $63 billion market value. The company said in a statement that the decision to stop the phase 3 trial is based on an independent group's analysis showing that the trials were unlikely to "meet their primary endpoint." The recommendation to stop the studies was not based on safety concerns, Biogen said. Expectations had been high for aducanumab as Goldman Sachs analysts had projected at one time that sales of the drug could reach $12 billion. "This disappointing news confirms the complexity of treating Alzheimer's disease and the need to further advance knowledge in neuroscience," said Michel Vounatsos, chief executive officer of Biogen, in a statement. "We are incredibly grateful to all the Alzheimer's disease patients, their families and the investigators who participated in the trials and contributed greatly to this research." Analysts weighed in after the announcement shocked the Street. "This was the largest opportunity and the most high-profile pipeline event for trial events in the entire space, you could argue, let alone for Biogen," said Jared Holz, a health-care analyst at Jefferies. "We've been talking about this for several years with an expectation we'd get a readout in 2020. There was obviously a chance you could have a futility analysis in 2019, but investors thought we were past that point." "All you are left with now is a value stock – it's essentially Gilead, a cheap stock with an unproven pipeline and a company that will be more reliant on M&A," Holz added. Biogen designs therapies for neurological and hematological disorders, ranging from multiple sclerosis to hemophilia. Though Biogen remains a key player in the treatment of multiple sclerosis, mounting competition had forced the Cambridge, Massachusetts-based company into new areas such as Alzheimer's. William Blair downgraded Biogen to market perform from outperform following the news. "We expect Biogen's stock to trade down to $240-260 (~20%) on this negative news, and we cannot find any near term catalysts that would help the stock recover back above $300," SVB Leerink analyst Geoffrey Porges said in a note. Morgan Stanley analyst Matthew Harrison called the discontinuation of the trial "a major negative."